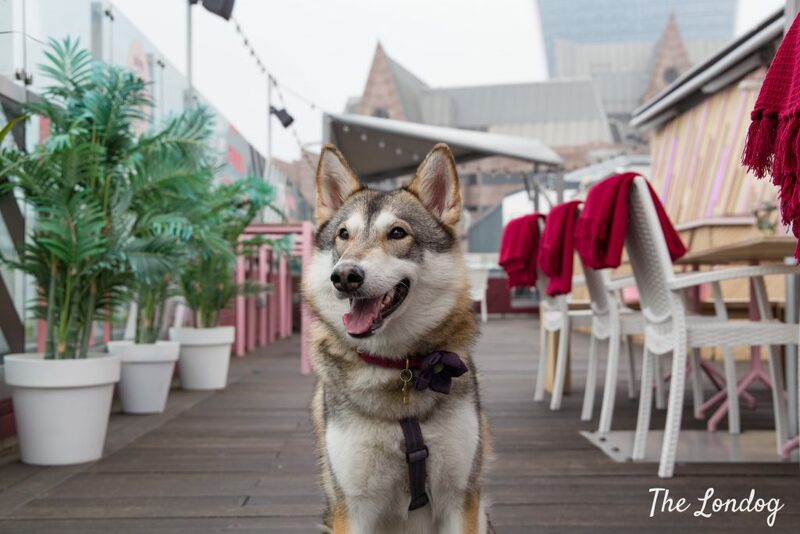 On Sunday 7th April, breath-taking rooftop Savage Garden hosted its first dog brunch, sponsored by vibrant ethical pet accessories brand Hiro + Wolf. 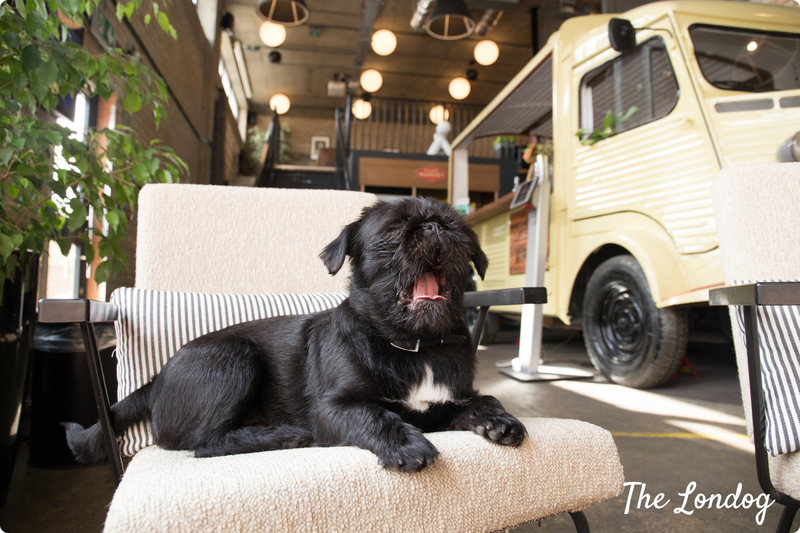 We were invited to try it out and, since Savage Garden Dog Brunch is set to be a monthly appointment, in this post we tell you all you need to know and our thoughts about the experience. At the 12th floor of DoubleTree by Hilton Hotel, in Pepys Street, paces from the Tower of London, there is the Savage Garden, a rooftop bar with sleek fittings and “decadent décor” as they say, stunning views over London’s landmarks including the Shard, the Tower of London, the Walkie-Talkie, St. Paul, and an amazing menu with food and cocktails. 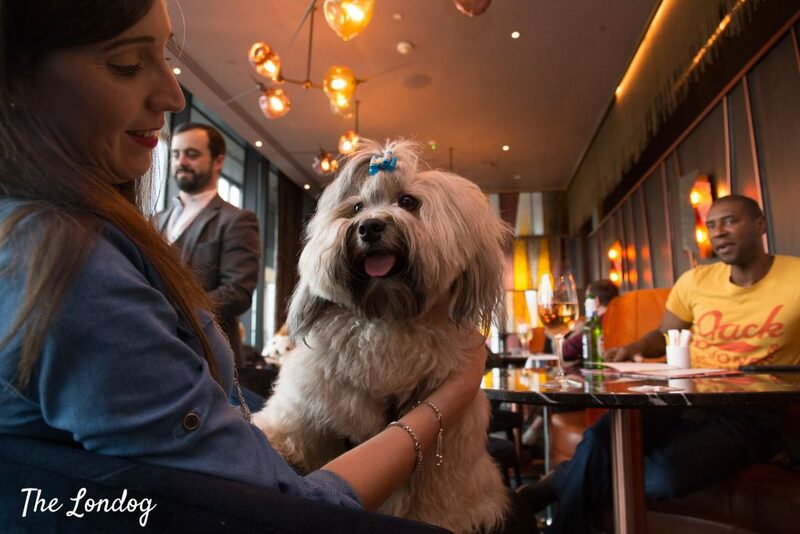 Normally it is not opened to dogs, but it exceptionally opened its doors to canines from 12 pm on Sunday 7th April for a Dog Brunch. 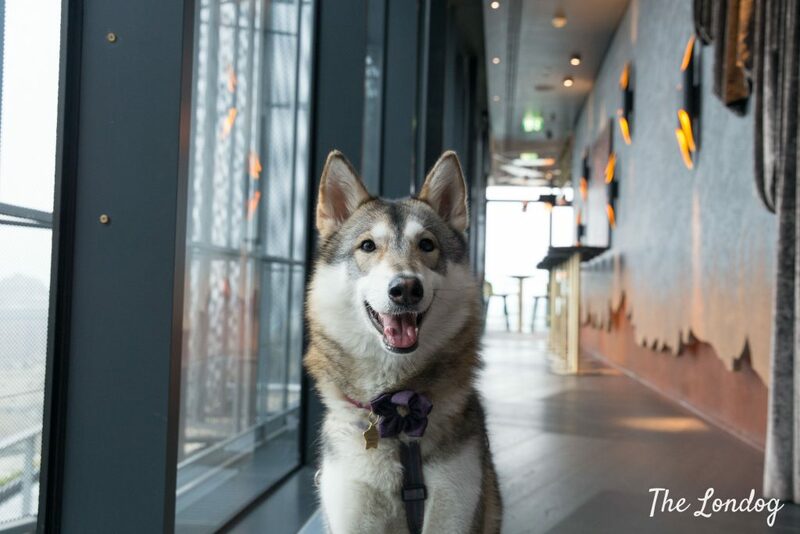 DoubleTree’s current dog policy welcomes guest’s pets up to 34 kg (with a £15 non-refundable deposit for stays at the hotel rooms), but dogs are not allowed in food and beverage areas unless for special events, so at the moment dog owners can’t just turn up with their pooches at Savage Garden at any time. 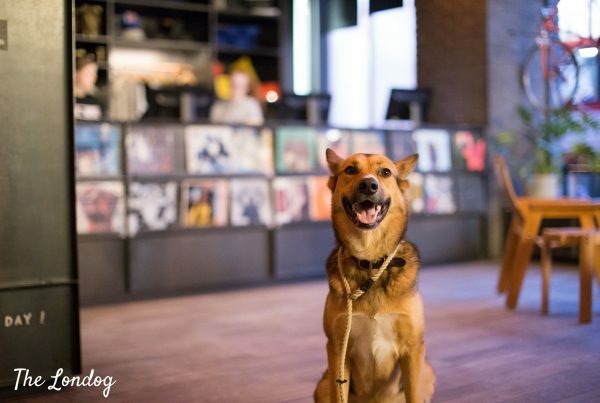 While the hotel is currently working on a review of their dog policy – we were told -, hoping that dog restrictions will be lifted, Savage Garden will be hosting regular dog brunches on the first Sunday of every month. The next of which is scheduled for Sunday 5th May 2019. 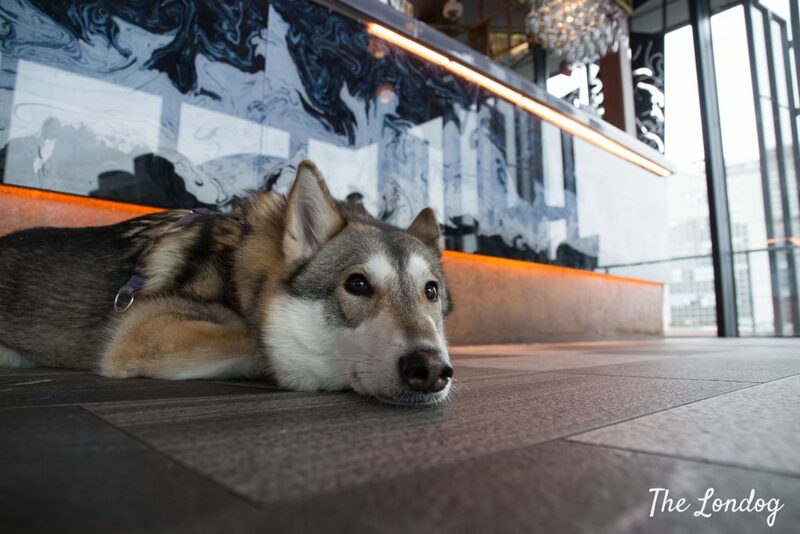 There are just two essential rules dogs and owners must abide by at the rooftop, which the staff told us at the entrance: 1) dogs must stay on a leash; 2) dogs are not allowed on the furniture (so no dogs on sofas, tables, counters, etc). So, for how used may dogs be to jump up on your couch/chair at home, good to have a pet carrier or keep them on your lap for this one: we all want this trial to be successful and eventually lead to opening to dogs at all times. 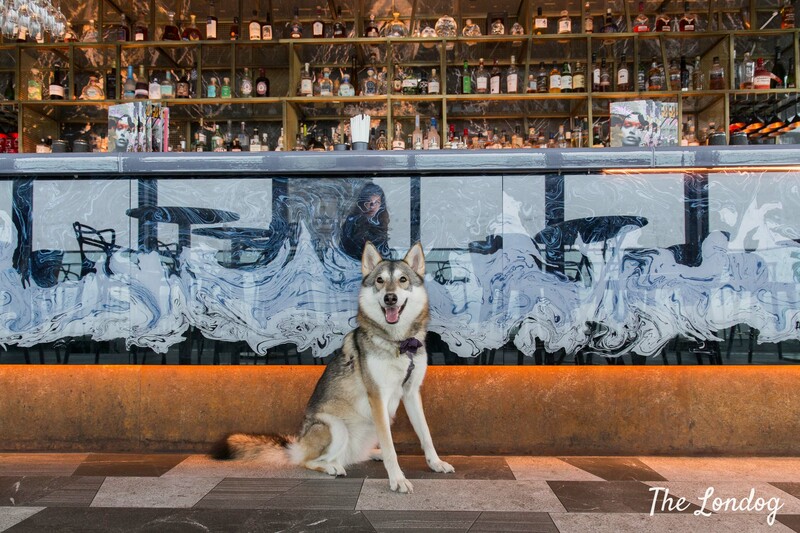 Without my husband around, Argo stayed at home for this one and I was joined by Eloisa and Lyanna the Tamaskan at the first Savage Garden Dog Brunch. We walked into DoubleTree Hotel and took the lift to the top. As we set pace out of the elevator, we found ourselves in a bright corridor, with wide windows from which we could admire the Tower Bridge framed by an orange indented glass. At the entrance we met host Bee with her sidekick Wolf, from Hiro + Wolf, sponsors of the event, who were giving the last touches to their stall when we arrived. So many colourful lovely items from their collections of leads, collars, bow ties and bandanas were on display. They also later told us about their newly launched Coastal Kikoy fabric collection, which Bee brought back from her last trip to Kenya, and about two new African Prints which Amy sourced from her travels and will be released in May. If you are an East Londoner, chances are you have visited their colourful shop in Columbia Road Market, which I find a great stop also if you are looking for hand-made ethical homewares and accessories from their sister brand Artisans & Adventurers. Being a bit early, we had the chance to have a walk around and admire the spectacular views while the rooftop was still empty, before other furry guests arrived. 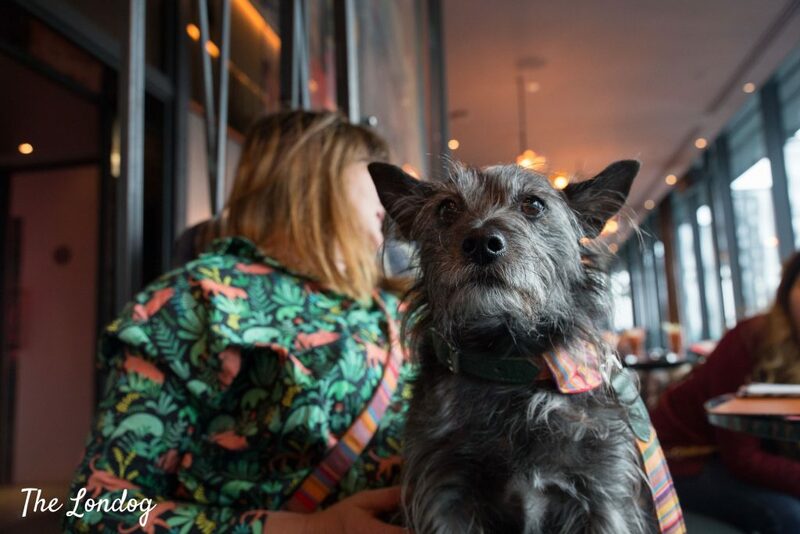 The organisers had reserved tables for each dog and human pack in the main bar area, indoor. This was a space decorated with velvet and leather armchairs and sofas, round marble tables and multicoloured windows at the entrance. A large glass wall on the long side allowed for an open view on the city. 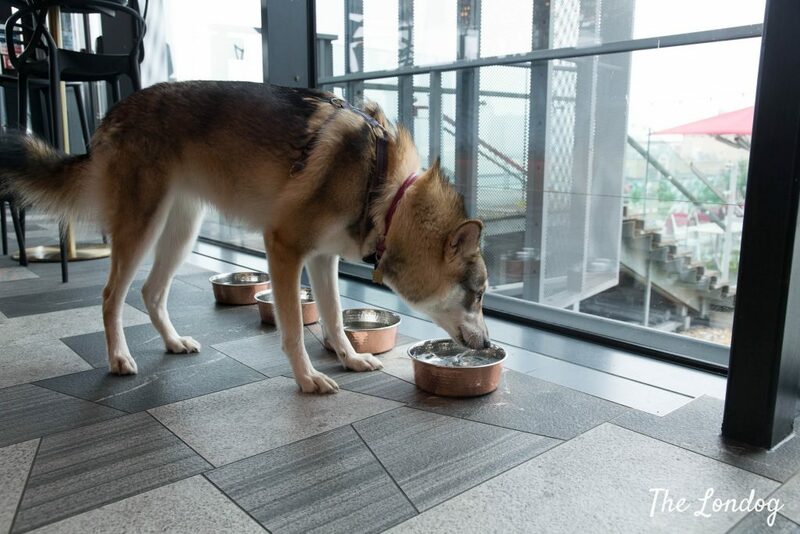 Savage Garden’s staff had thought about thirsty dogs and placed rows of copper water bowls along the windows, which Lyanna promptly took advantage of. 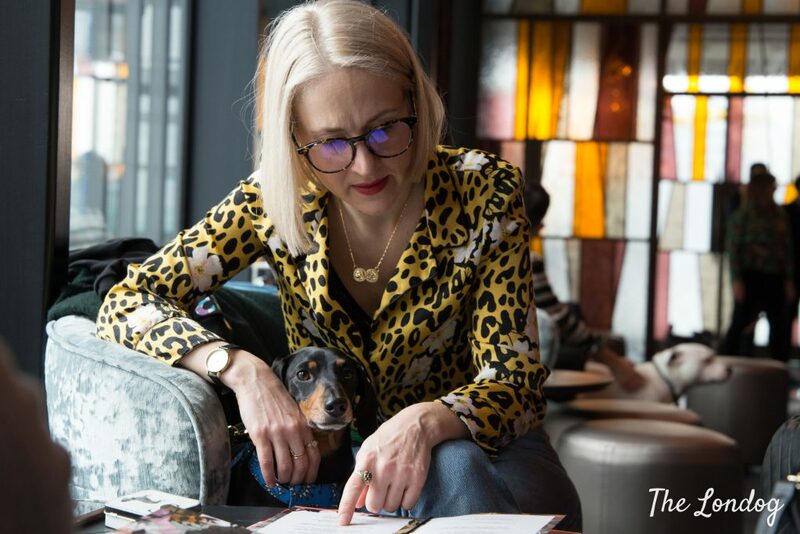 They told us that they were expecting 49 four-legged over the day, for a fully booked brunch, and some commented that it would have been their best day at work ever. As guests started to arrive, we met other known pooches, including Miss Darcy (and George – who was confined in a buggy with a cone due to recent surgery, poor him) and Freddy the Cockapoo, Goose the staffie, and we made a few new encounters, including Jeffinho the Golden Retriever, a massive lovable pup! Savage Garden had announced a wild brunch menu, moving from the traditional dishes, with Panko chicken cutlet, bacon and radish salad, cranberry, caper, siracha mayo and a sunny-side fried eggs as well as bourbon glazed beef short rib, charred sourdough and poached eggs. Indeed it was an original spin. We didn’t try the cocktails (although we saw bloody mary’s passing by), but had some glorious platain chips, with lime chilli salt and avocado hummus to share. Following that starter, I got the Eggs Beneditc a la Savage, which came with poached eggs, grilled mortadella focaccia and nduja hollandaise, while Eloisa had the Smoked Pancetta Mac & Cheese, which also looked good. We didn’t indulge in the dessert, although that also looked pretty tempting. With our food came a Savage dog-friendly baked pupcake for Lyanna. As soon as she was told she could have it, instead of nipping it at the top, she opened her mouth and hoovered it in a mouthful. Eloisa didn’t even manage to take the paper of the pupcake out that Lyanna had already swallowed it all. Safe to say that it received her seal of approval. Hiro, the Shiba Inu, partner in crime of Wolf, was not in on the day, but Bee told us a bit about them both. 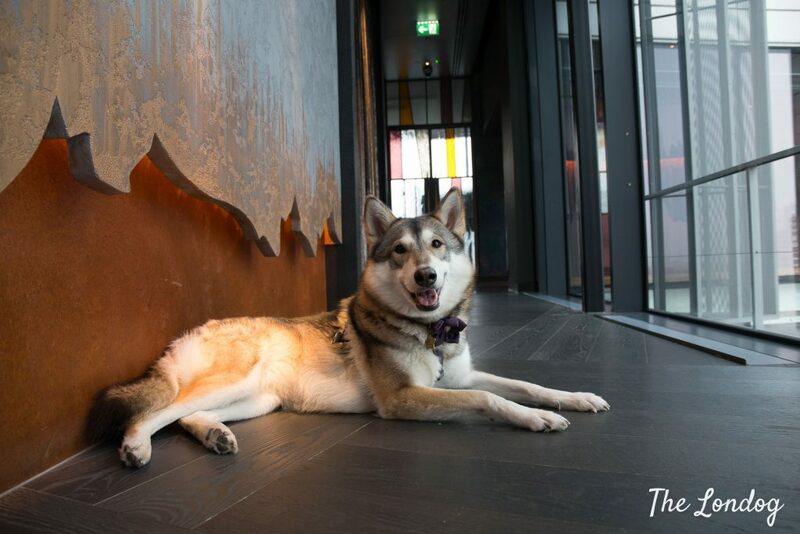 “Hiro and Wolf have been best friends since pups even though their personalities are like chalk and cheese! 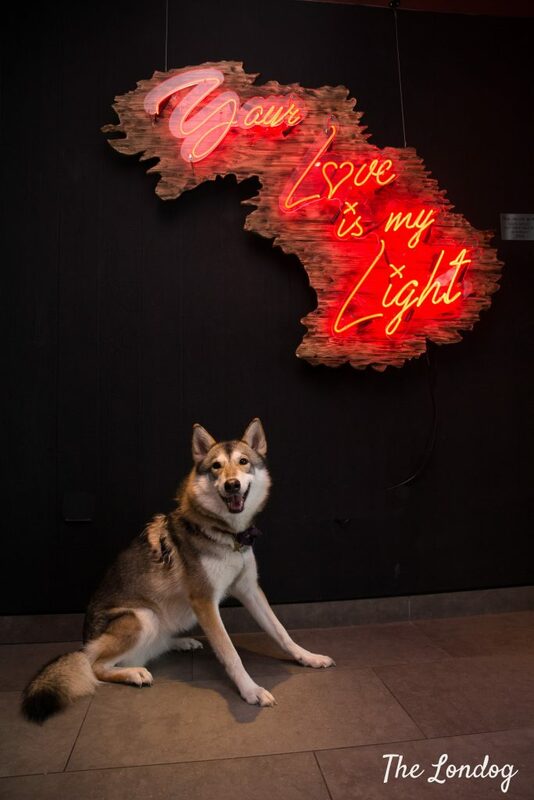 Wolf is definitely the most sociable of the duo, he loves to chat and has a special spot in our shop to greet customers from as they come in. He’s always on the look out for snacks and a nice warm lap to curl up in. Hiro is happiest sleeping (literally 21hours a day) in what to us humans looks like the most uncomfortable place he can find even though he has the choice of four dog beds in our studio! They both love long runs on the beach in Margate and cuddling in front of a good film”, says Bee. 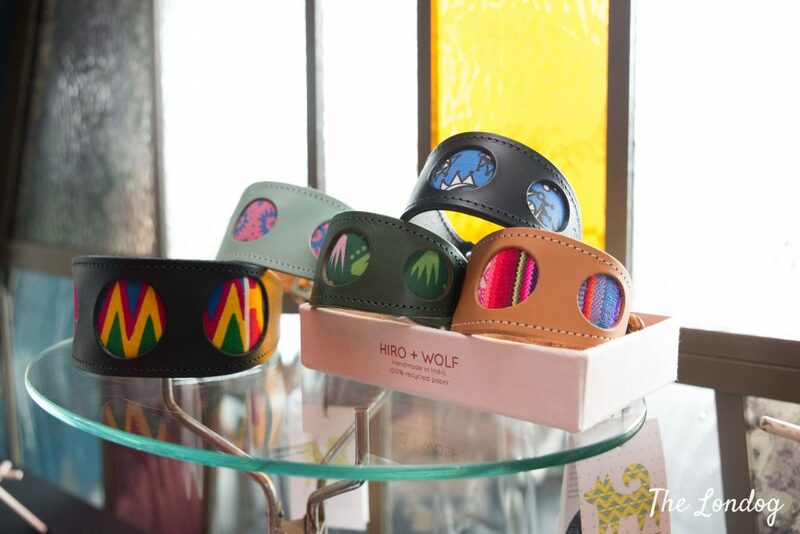 Hiro + Wolf had also prepared a goodie bag to treat each each hound, made of recycled paper and containing a lovely colourful bow tie of theirs and a dog breakfast pack from Lily’s Kitchen. Bee also told us that Hiro + Wolf are organising another fun event in Margate, this Good Friday: an Good Furday Fancy Dress Dog Treasure Hunt with Lily’s Kitchen snacks for all and prizes from Hiro + Wolf. The weather was not the best on Sunday, with not yet spring-like temperatures and a much fog. 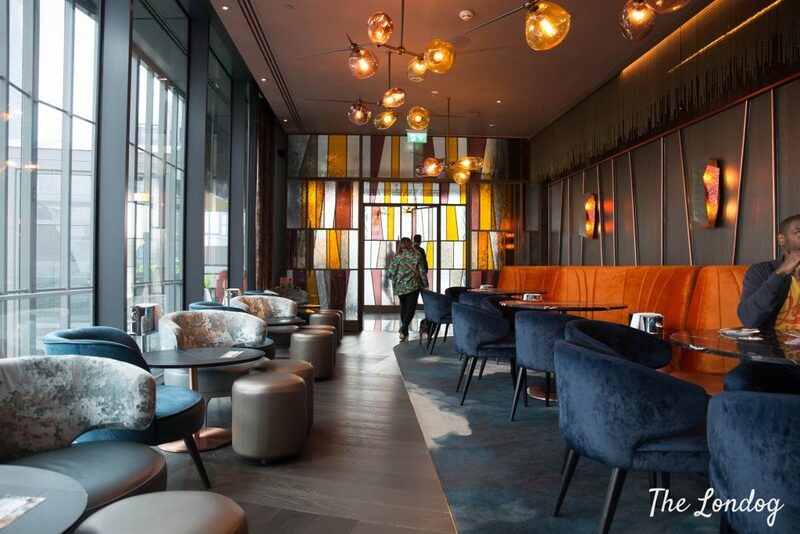 The tables had all been arranged indoor, in the main bar area, however, Savage Garden also has a lovely terrace, referred to as the Pink Gin Terrace, from the Beefeater pink gin branded fittings. The terrace could be reached from a glass door from the bar area, walking down some steps on the deck. Plants, tables with blankets to warm up until Summer comes and pink fittings, with the huge Walkie-Talkie on the background, just behind another building. We sneaked out for some pics, as we saw a water bowl outside and, despite the not great weather, it was not difficult to imagine the incredible sight it must be when the sun is shining. 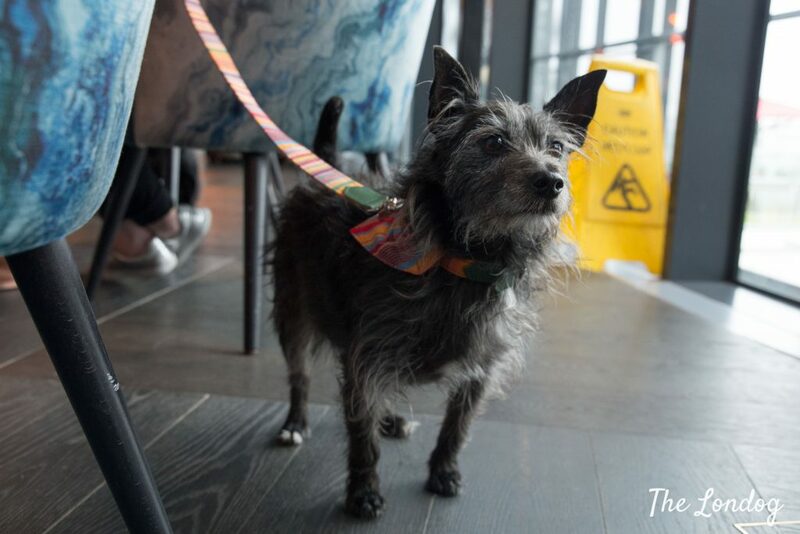 We asked Savage Garden’s staff whether the next dog brunch will see dogs on the terrace too. We were told that the outdoor terrace will be open for brunch weather permitting (while their indoor space will always be available). 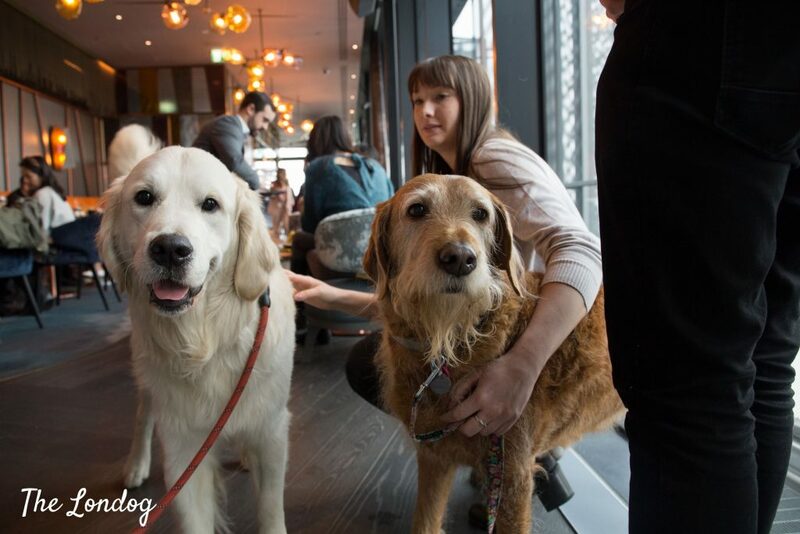 If you don’t want to miss the opporunity to visit, save the date of the next Savage Garden Dog Brunch: Sunday 5th May 2019, from 12 to 4pm, and bookings are for 2 hour slots. Make sure you book soon, as it seems it will be very popular and spaces are limited. 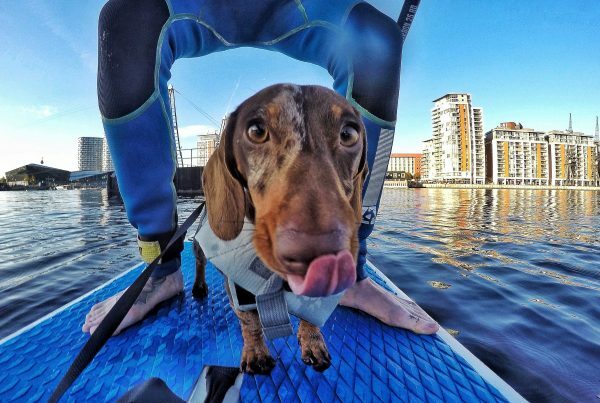 If you are coming from out of London, you can stay at DoubleTree by Hilton with your dog (or check out some useful hacks to find another dog-friendly accomodation) and enjoy sightseeing for the weekend, with many dog-friendly attractions nearby, including the Tower Bridge Exhibition, St Dunstan in the East, and more. 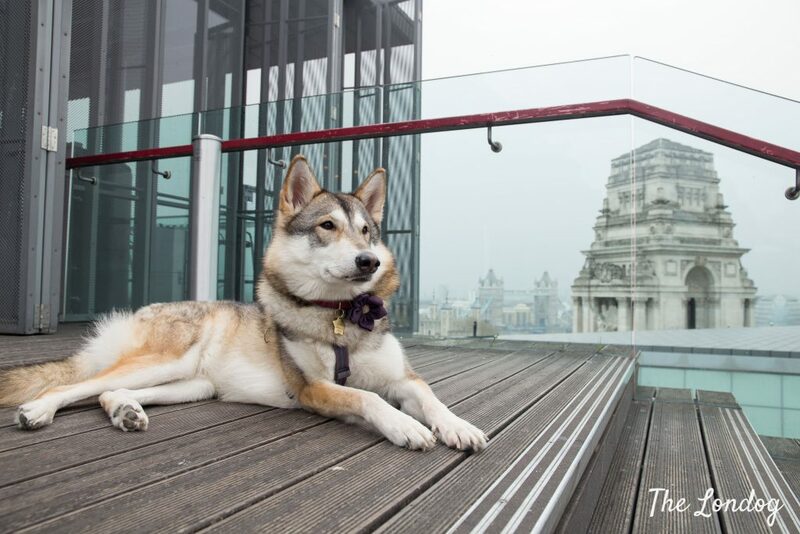 If you love high views, you can also explore London’s dog-friendly rooftops to find your favourite one. We just updated and expanded our guide adding all re-opening dates! Disclosure: we were invited to and offered the Savage Garden Dog Brunch. We also received a goodie bag from Hiro + Wolf. This blog post is an independent review and all views are our own.